Chamlee - Charming Rustic Cabin with a large flat yard perfect for your four-legged family. 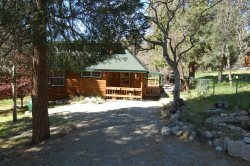 This is a true rugged Idyllwild Cabin located 1.6 miles from the heart of town. Perfect for the couple or a couple of friends, this cabin is a great place to relax and get away from it all. With a beautiful large fenced yard for your pets, you may have trouble getting them to leave when it's time to go home. On the covered front porch, there is a table to relax at while you enjoy cocktails, bar b q, or drink in the beautiful views of the pine trees. While you are relaxing, be aware of and enjoy all the mountain sights and sounds. The many varieties of birds, squirrels, and chipmunks will always gladly accept seeds or nuts if you offer. Enter through the beautiful vintage door into the living room. This adorable room features a table for four, cozy couches, TV, games for the entire family, and a huge wood burning fire place. Vaulted ceilings, exposed beams, log walls, and log stair railings add to the charm of this gem of a cabin. Off the living room, there is a full kitchen with all the conveniences of home only smaller. Pass the full laundry room to the downstairs bedroom and adorable rustic bathroom complete with vintage claw foot tub. Back to the living room and up the stairs, you will find a charming A frame bedroom with a full bed and big cozy chair. A perfect place to snuggle up at the end of your day. This cabin is a true mountain cabin suitable for anyone who wants to really enjoy what Idyllwild has to offer. Whether you want to take a stroll into town, BBQ on the front porch or just sit and relax, this is definitely the place to do it. WiFi was added August 2016! This property is located 1.6 miles from the heart of town. If you would like to come earlier or stay a little later, check with the office, if it does not conflict with another reservation we are pretty flexible.